io9 March Madness Final Four: Harry Potter vs. Lord of the Rings! We're down to our last four competitors in our quest to find the greatest work of science fiction and fantasy ever! Star Wars and Doctor Who are battling it out to represent science fiction in our championship game, while Lord of the Rings and Harry Potter are locked in combat to raise the fantasy banner. So vote now! Both of our polls are now open and can be found at the bottom of the post. They will remain open until midnight Pacific time tonight, so VOTE NOW to keep the madness rolling into Friday's championship game! By now, you hopefully know what this little tournament is all about, but if you're only just finding out about this, then go here for more details. io9&apos;s March Madness: Science Fiction vs. Fantasy! Otherwise, look below for our updated bracket; a really big version is available right here. So, how did our Final Four contestants reach this point? For all the madness and all the underdogs — two double-digit seeds made it to the Elite Eight — we find four of our initial heavy favorites still standing. Lord of the Rings is our only competitor to roll into the Final Four after taking more than 60% of the vote in the Elite Eight, as it dispatched Game of Thrones by a comfortable 62-38 margin. Still, that's the closet battle that Tolkien's legendarium has had so far, and each round gets a bit closer; in fact, Lord of the Rings has lost an average of ten percentage points with each round. The good news for Hobbit fans is that, if that pattern should hold, Lord of the Rings would be projected to win 52-48 over Harry Potter... give or take a few percentage points. Such a close contest would be familiar territory for the Hogwarts gang, as the 58-42 win over Buffy the Vampire Slayer was actually Harry Potter's most comfortable victory of the tournament; it's managed to make it to the Final Four while only averaging 55% of the vote. Still, you only need 50% plus one vote to win, so which of these fantasy juggernauts will emerge victorious? Let's move over to the science fiction side of the bracket — and yes, let's all take a deep breath and say that, for our immediate purposes, Star Wars and Doctor Who can be considered science fiction, even if both have more than their fair share of fantastical elements, and that we're not making any broader statements about which genre these two fit into. Anyway, Star Wars finally ended Firefly's latest underdog run, coming away with a 55-45 victory. Firefly fans managed to close the gap, considering Star Wars was was leading around 64-36 for the first few hours. Still, Star Wars was ultimately able to maintain a consistent lead of just under 2,000 votes, even as the percentages continued to creep closer. That was the first real challenge Star Wars faced on the way here, averaging 75% of the vote in the three previous rounds. Doctor Who had the narrowest victory of the Elite Eight, as play-in survivors the X-Men fell 52-48. Doctor Who hasn't notched any overwhelming victories on its march to the Final Four, but its faced four iconic competitors in the X-Men, Blade Runner, The X-Files, and The Matrix. 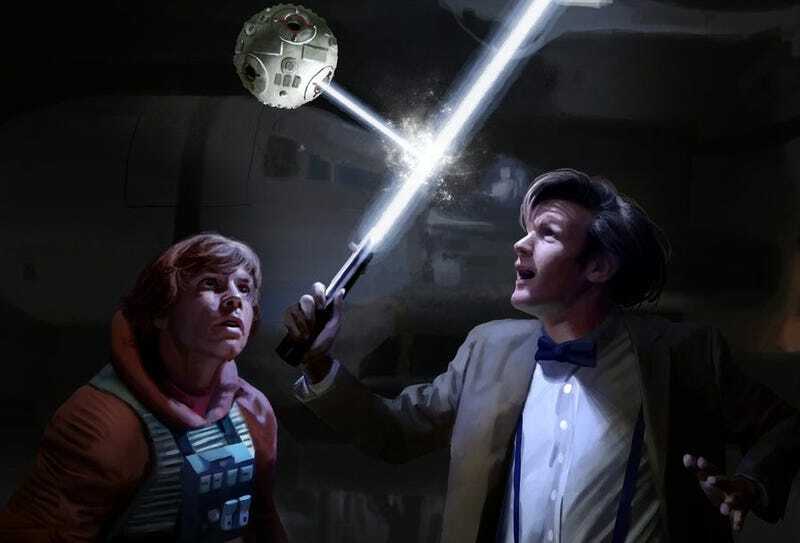 So who will emerge triumphant in the showdown between Jedi and Time Lords? The only ones who can make that decision are YOU, so VOTE NOW. Polls will remain open until midnight Pacific time tonight! And be sure to come back Friday for our championship game!